SPRING is slowly emerging in the garden and lawns have had their first few mows after a cold start and heavy rains. Grass has taken a battering and moss may be a problem but now is the time to take action for a healthy sward this summer. DJ Turfcare, one of the leading suppliers of turf machinery and products to both amateur gardeners and professional groundcare specialists, has put together an easy-to-follow guide for all lawn enthusiasts. David Jenkins, managing director, says: “Even a tired lawn on poorly-drained ground and suffering from moss can be helped back to life with a few simple moves. “You don’t have to use chemicals for a superb lawn and we work with manufacturers and suppliers in Belgium who only supply organic products. “If you want to be kind to your garden and the environment it only takes a careful plan of action for brilliant results. *Give your lawn a thorough inspection during early May. Make a note of problems like moss, poor drainage and poor grass cover. Clear any winter debris. *For early season mowing set the blades high. Mowing encourages root development as the days warm up so mowing is crucial. It also keeps lawn weeds from developing. Make sure the clippings are removed to the compost heap, and mixed with other garden waste for best composting results. *Lawn feed: The nutrients in MO BACTER (npk 5-5-20) feed the grass for up to three months. Use MO BACTER from March through to the end of September for best results. A second application can be applied three months after the first (up until the end of September) for severe moss problems. 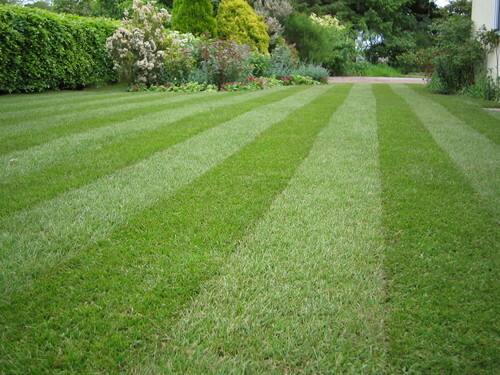 After applying MO BACTER avoid mowing for about a week and then cut at normal height. *If drainage is a problem aeration is needed. Either use a mechanical aerator (which pushes tines into the soil) if the lawn is large or use a hand-held fork if the area is small. Push the fork into the ground at two-to-three inch intervals and wiggle slightly. *After the moss has gone you can improve the soil with a general topdressing of good quality topsoil and sand, adding some seed that is compatable with the grass varieties on your lawn. Keep well watered until the new seed is established. This press release was distributed by ResponseSource Press Release Wire on behalf of Oakfield Media in the following categories: Leisure & Hobbies, Home & Garden, Environment & Nature, for more information visit https://pressreleasewire.responsesource.com/about.